For Huawei's online-only sub-brand, what comes after the Honor 9 is probably the Honor Note 9 - at least if we go by what happened last year with their respective predecessors, the Honor 8 and Honor Note 8. The latter of those two got official in August 2016, so perhaps it's high time we see an Honor Note 9 being announced? That very well may be, since the first leak regarding the upcoming device has already surfaced. A source in China claims the Honor Note 9 will boast a huge 4,600 mAh battery, 100 mAh larger than its predecessor's. The Honor Note 9 should be powered by the HiSilicon Kirin 965 chipset, which hasn't been spotted in another device yet, paired with 6GB of RAM and 64GB of built-in storage. 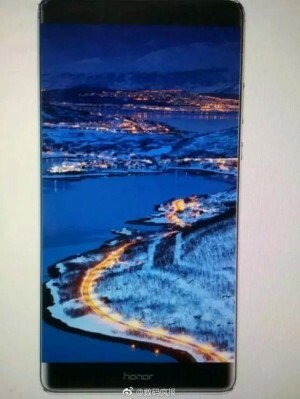 The phone will apparently come with two 12 MP cameras on its back, and a "full-screen" display allegedly depicted by the image you can see above. That's definitely less "full" of a screen compared to Samsung's Infinity Displays or LG's Full Vision panel for its G6, but for a brand that's focusing primarily on bang for your buck that might not be a huge problem. The Honor Note 9 is said to make an appearance in an online store near you at some point in September. Its real or fake? Presents on IFA? Hopeful with stereo speaker & AMOLED!!! Hopeful Global?! ?